Welcome to my new blog series! This will be an ongoing series chronicling what I pack my husband for lunch. For some background information; my husband is a heavy duty diesel mechanic that works 8-12 hour shifts usually 6 days a week. He works a combination of mostly afternoons with a day shift and a midnight shift thrown in once a week. His “lunch” is usually eaten at dinner time. I usually pack him the leftovers of what local toddler and I ate the night before for dinner. This series will give you a good overview of what I make for my family on a regular basis. We are an average family, pinching pennies just like everybody else. As I always have tried on my blog, I want to address that real food is not elitist. We struggle with money like anybody else, but food is important to us. Because local hubby works such long hours at such a physical job, I pack him a ton of food. He’s also resistant to eating breakfast. He enjoys some “cheat” foods that I pack for him. I will not claim that everything I pack for him fits the criteria of real food, but it is certainly better than a drive thru. We are all works in progress! I will probably aim to make this a weekly series, but because I often have “repeats” there will not be a whole weeks worth in each post. He also usually buys lunch once a week with his coworkers. We budget for this because it breaks up the monotony of him eating his meal every night while they buy food every night. Also he works in Detroit, which is foodie heaven. I will post links to recipes when available, but if you want more information about a meal please don’t hesitate to ask! Enough of my yammering, lets get to the food! 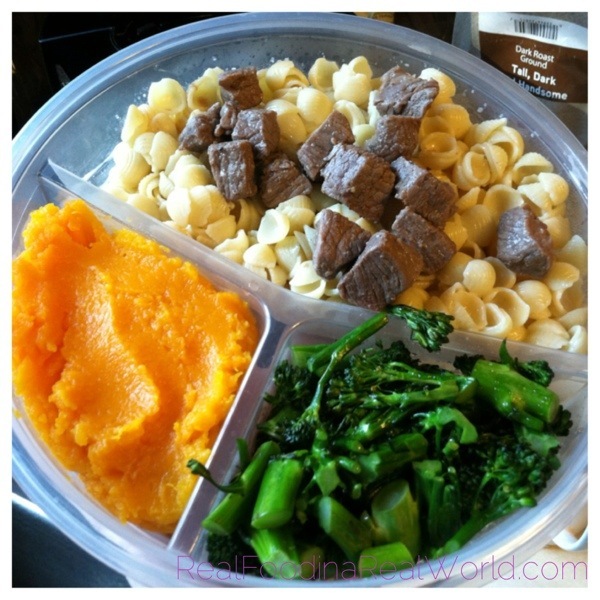 This day was some Annie’s macaroni and cheese with some pieces of steak on top. A whole bunch of roasted butternut squash and yummy roasted broccoli. This photo and the two below it are all together, but I thought I should show individual pictures so you can see what is in each container. This was for one of his longer days so it is probably 2-3 meals. 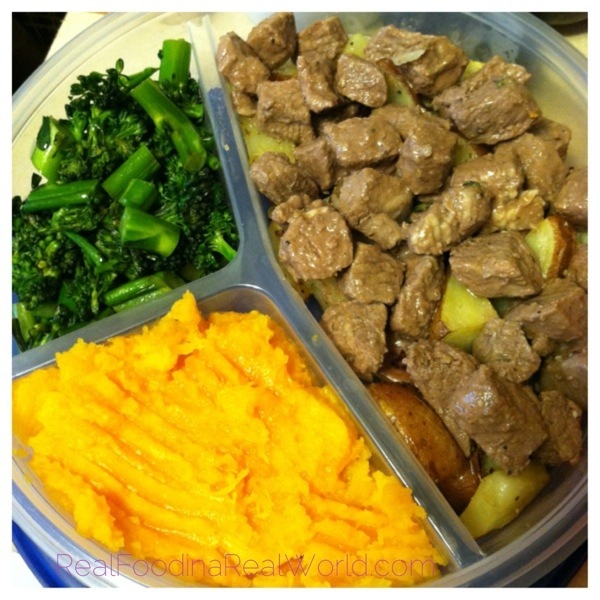 The same roasted squash and broccoli as above, with oven roasted potatoes and steak. 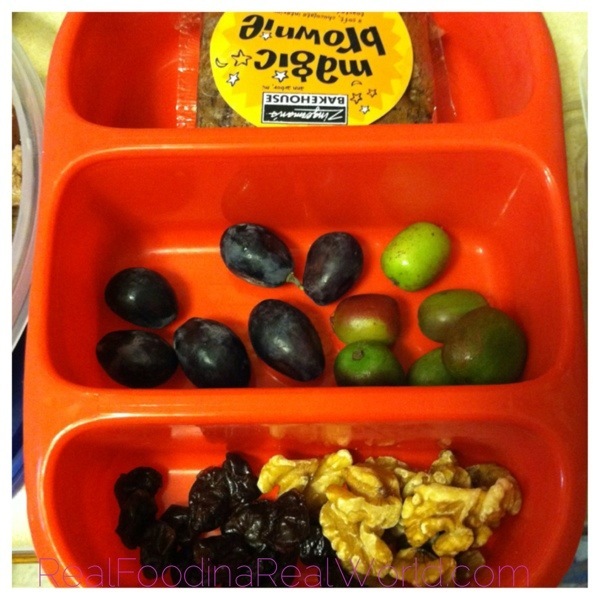 In the Goodbyn, we have a Zingermans brownie, grapes and kiwi berries, and some dried cherries and walnuts to put on his salad. Just some plain spinach for a salad. 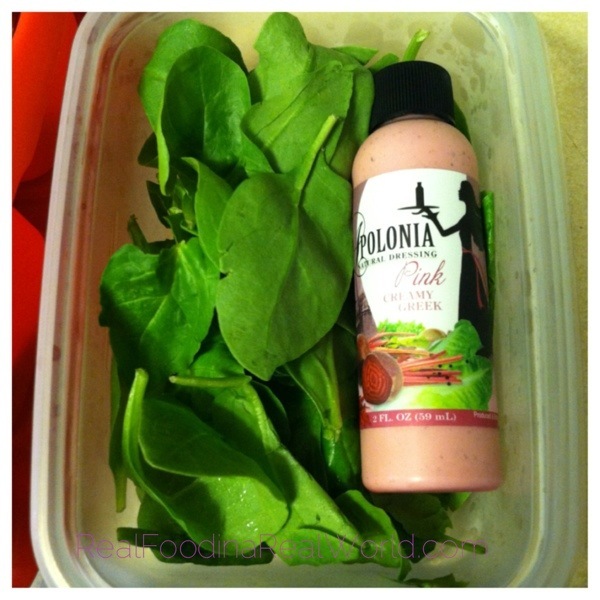 We love this pink creamy Greek dressing from Apolonia. Trying to find good containers to send dressing in, thankfully we had this little sample bottle. Hey look, more squash! Seriously, this squash was gigantic! Lots of whole wheat penne pasta topped with chicken that was baked with a little Celtic sea salt and Apolonia oily Greek dressing. Some organic frozen peas (Alexia brand) to finish it off. I would love your feedback on this series! You have a lucky husband! ;-). Thanks for the inspiration! How did you season your squash? Miss seeing you at Starfish! I like to think he’s lucky! I’m also lucky to be married to the hardest working man I know! We are kind of boring and don’t season it at all, I just roast it in the oven. We will be there Wednesday! Ooh.. that steak and potatoes looks delicious!! 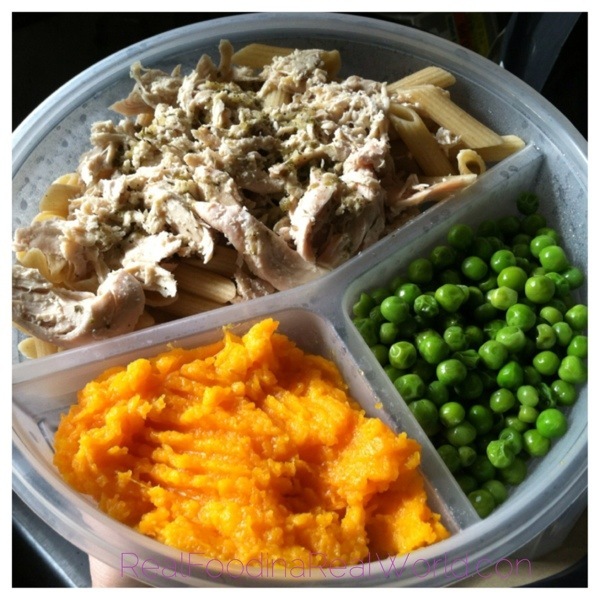 How do you prep it? Thanks! It was! I just used garlic and Celtic sea salt. I may have patted myself on the back. Oops! That would be helpful right?! These were oven roasted. Just cut, tossed in some oil garlic and sea salt and baked at like 350 for an hour or so. And the steak? Sorry.. lol. I’m so sorry, I didn’t see this question! It was a weird sirloin with bones so I ended up cutting strips and stir frying with garlic and Celtic sea salt.